People trust their lives to our equipment so our engineering team makes sure that the product will not break. Our components are designed to exceed the most stringent safety requirements. In all cases our platforms are tested to 150% overload. In many cases components have been tested to destruction on our in house hydraulic overload test rig, which is capable of applying forces of up to 15 tonnes. This tells us exactly how strong our components are, and exactly where the weakest points lie. New designs are subject to sophisticated numerical modelling, followed by finite element analysis (FEA), followed by strain measurement under overload. This allows us to be certain, that if our products are used correctly, and even if they are abused to a certain extent, they will always carry people safely to the ground. We exceed the requirements of these standards, and also meet ISO standard 16368, which is the international equivalent of BSEN 280. Components must be strong enough, but they should not be too strong. Excess strength in a machine is like a person carrying too much fat, it adds weight but little else. The ideal component has no “passive” material, every ounce should at some point come under strain. In practice this is not possible, there will always areas which are under minimal stress, but by focussing on these areas almost as much as the parts which are under the highest stress, and reducing or eliminating them where possible, we trim excess material from our designs and we make our products lighter. Whenever a component design is reviewed opportunities for weight reduction are explored. No weight saving is too small. Ten grams is worth having. A kilogram is a minor triumph. Technology progresses continually, opening up ways to do things better. New manufacturing processes, materials and control technologies are continuously becoming relevant and opening opportunities for product improvement. We adopt new methods as quickly as they become relevant, and update designs rapidly in response. Our control systems offer a suite of innovative features which offer improved productivity, through providing greater outreach, higher speed operation or reduced down-time. These are available because we use up to the minute industrial control and communications technologies. There is sometimes no substitute for a little inspiration. 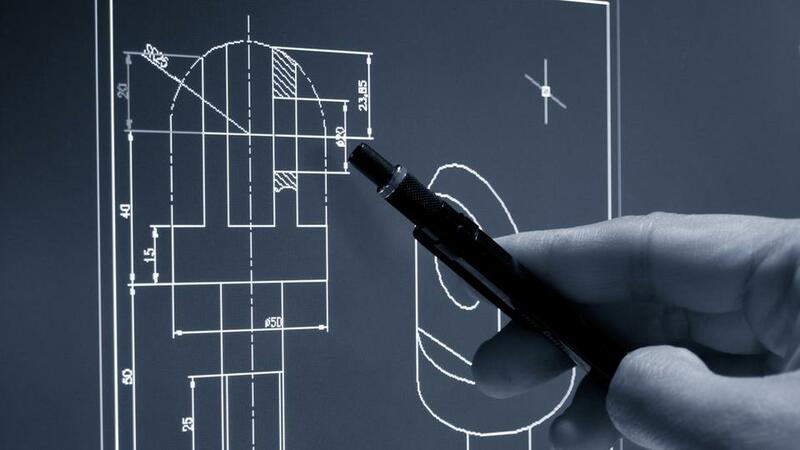 Our multi-disciplinary design team includes expertise in mechanics, hydraulics, mathematics, electronics and composite materials. This diversity of different perspectives combine to provide fertile ground for generating innovative solutions. The results are elegant solutions which deliver robust and efficient designs at lower cost, allowing us to make products which meet your requirements in full. In view of the fact that composite materials are used by industries which require high strength at low weight, it was decided in 2013, that at over 50kg our baskets should be made lighter. The material makeup of the product and the manufacturing process were reviewed, as well as the steel inserts which were used as harness anchors and fixings to the remainder of the platform. The old fixings had proven their worth under testing but weighed over 5kg in total, and therefore represented around 10% of the total weight of the basket. Through prior experience our GRP team knew of some samples of off the shelf steel inserts. These were sourced, and incorporated into a test laminate sandwich which consisted of two layers of glass fibre reinforcement either side of a lightweight honeycomb core material. 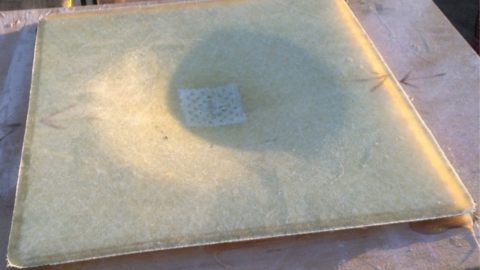 The samples were tested and found to fail at a tensile load of 400kg. The pattern of failure was analysed, and a revised in –house anchor design was developed. Under testing the revised anchor failed at 600kg. A further cycle of analysis and testing resulted in the final design, including an innovative arrangement of fibre reinforcement. This design failed at over 900kg, which exceeded the requirement for inclusion in the design. A test basket was manufactured using the new GPR anchors. All the normal basket overload and deformation tests were carried out as specified in EN 280, without any concerns being raised. However it had long been felt by the design team that a drop tests specified in ISO 16368 should be included in the testing regime. This test is specified for fall arrest harness anchors, to ensure that they were indeed capable of arresting a fall. The harness anchors provided on Aldercote platforms are fall restraint anchors, which should prevent an operator reaching a position where a fall is possible. As such our anchors were not required to meet the fall arrest requirements. 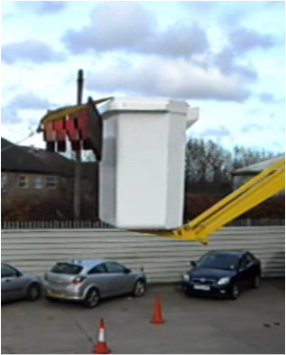 However the design team considered that an ill equipped operator may one day fall from the bucket, and that this eventuality should therefore be tested. 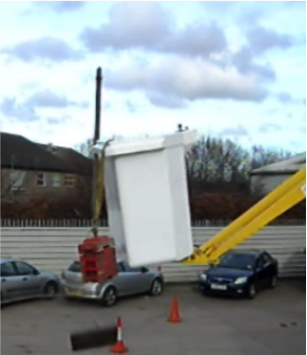 The test consisted of dropping 100kg on an inextensible lanyard 1.3m from the bucket edge. Snapshots of this test are shown below. 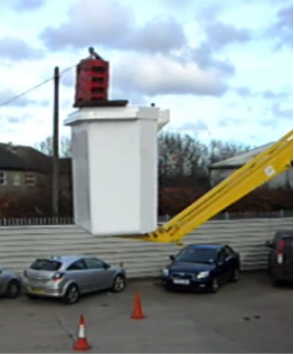 The peak loading on the rim of the basket during this test is approximately 400kg, which is double the rated load for the basket floor. The only damage was some bruising where the weights swung back and impacted the bottom of the basket. The mass of the 6 new GRP anchors was 134grams each, giving a total of 804 grams per bucket, the saving over the previous anchors was 4.3kg or 80%. This contributed to a final bucket mass of less than 30kg, meaning a total saving of over 20kg, resulting in greater outreach greater vehicle payload, and / or higher rated load.